It’s Day Two of Santa Cruz Restaurant Examiner/Santa Cruz Foodie’s “12 Days of Christmas Giveaway.” See end of article for how to win great coffee from Peet’s. And if you haven’t finished (or started) your holiday shopping, here are some items to consider for coffee fans on your gift list. Peet’s Holiday Blend: An annual tradition, this year’s special blend is spicy, rich and satisfying, slightly bittersweet balanced by notes of ripe fruit to create a smooth and full finish. 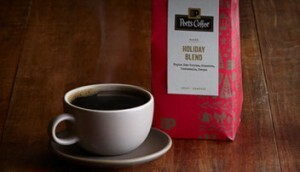 It’s available at Peet’s cafes, local grocery stores and online (peets.com). It can be purchased by itself or as part of several gift packages. For example, if your gift recipient has a sweet tooth, there’s a gift set with a half-pound of 2015 Holiday Blend coffee and a three-piece package of popular Jo’s Peppermint Bark. Exclusive Single-Origin Coffees in Festive Gold Tins: Peet’s exclusive line of exotic and rare premium coffees – CoopeDota Micro, Kona Peaberry and Jamaica Blue Mountain–are hand-scooped into golden keepsake tins. They’re available at all Peet’s stores nationwide. DIY Coffee Lover Gift: You can use Peet’s premium coffee beans/grounds to make something creative. Peet’s suggests either 1) a DIY cold brew kit with the Holiday Blend or Peet’s Baridi (a special blend formulated for cold coffee), a re-usable coffee filter and a sampling of sweeteners. Stuff into a large mason jar and tie with a festive ribbon; or 2) a holiday survival kit including Peet’s coffee, bath products, candles, energy bars, a stress ball, and medicine for when you’ve attended one-too-many Christmas parties. To enter, email your name to tfatemi@gmail.com by 9 pm. Tuesday, Dec. 15 and include the word “Peet’s.” The drawing will take place the next morning and the winners will be notified via email.